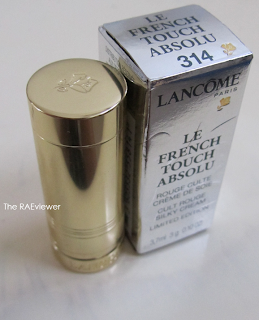 My second favorite piece from Lancome's Fall 2011 collection is the limited edition Le French Touch Absolu Cult Rouge Silky Cream lipstick. [I featured my favorite piece, the Maison blusher, last month here.] Le French Touch is an ultra chic, berry red housed in a retro miniscule gold bullet that slips easily into my jeans front pocket. This entire collection's reds are very characteristic of my personal take on the iconic color - sheer, glossy, polished. This is the most expensive Lancome lipstick I have ever purchased at $35 but it was worth every penny. 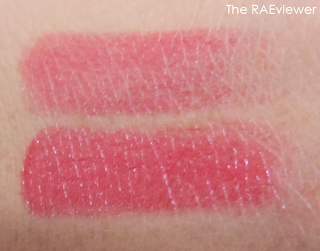 The color is buildable, as you can see in the swatches above, and the formula is hydrating but has virtually no slip. Impressed yet? If not, let me tell you in all honesty that I could and would wear this beautiful red daily. The thin veil of color magically perks up my complexion on rough mornings. And not only is there a very generous amount of product in the itty bitty bullet, the engravings on the case make it a masterpiece of a collector's item. hi rae, have you tried the lancome absolute nu rose veil lippies? Hi Rae, I really want to try this because the product looks gorgeous but i've never worn red lipstick before. As a 22-year-old korean girl who always gets mistaken for a high school student, I don't know that I could pull this off. Will red lipstick make me look older (like they say online?) or ... even younger (like a little girl playing with her mom's makeup..) Please advise.. Thanks in advance! hey rae if you are asked to recommend just one iconic red lipstick. which one would u choose? is this le french touch better than chanel cooco rouge? Anne - No, I haven't! Lesley - I wouldn't recommend this if you wanted an 'iconic' red lip color. I would stick to a true opaque red with a creme finish. 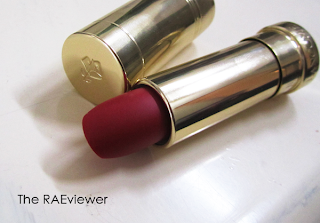 Chanel's red Rouge Allure in Excessive is one of my favorites!